A few weeks ago, I went to Monte Carlo to play in the European Poker Tour (EPT) Championship event. It was a $10,000 buy-in poker tournament, and we had almost 700 runners play, with a first prize of 1.8 million Euros (more than $2 million). 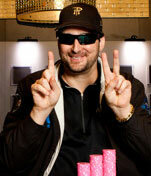 I was excited to be there, and pumped up to play some great poker. But before we get to the tournament, let me admit that I had the biggest loss of my life over there. While I was walking through the famous lobby of the Hotel de Paris, I ran into Patrick Antonius and Phil Ivey. I am always looking for good energy, and I thought that it might be a good omen that the Hotel de Paris had PH logo hats and PH logo bathrobes. Antonius and Ivey were playing Chinese poker, which is like flipping coins in that there isn’t much skill involved in the game. I sat down and joined them, but requested that we play for “only” $1,000 a point. When I was down 76 points, I asked to play for $2,000 a point. A few hours later, Antonius quit, and we went to Ivey’s suite to order room service (they wouldn’t serve us in the lobby) while we played. Things got ugly, and by 10 a.m. I was forced to quit, down a whopping $536,000. I had to ask: why didn’t I walk in to the hotel 20 minutes earlier and miss the boys? This was the biggest loss of my life five times over: Ten years ago, I lost $110,000 of my own money. How could I lose that much “flipping coins” while not even playing a game of skill? So much for the PH logo being a good omen; but still, I could come out of this way ahead, if only I could finish in the final four in the EPT Championship event. I showed up the very next day (for Day 1 of the EPT) at 7 p.m. Of course, the tournament started at 2 p.m., but I didn’t seem to care. I was still shell-shocked from the night before. At this point, I caught a break when the tournament directors couldn’t find my seat number (I’m sure that they didn’t expect anyone five hours late), and they told me that I needed to play on Day 2 instead. I didn’t care about catching a break, I was ready to play right then and there, but I didn’t complain (realizing on some level that I had caught a break). So I walked back to my hotel with the thought of trying to cool myself down (and prepare myself mentally) to play 17 hours later. I couldn’t let the worst loss of my life by far stop me, could I? What was I made of? Was I a champion or a dog? It was time to show my mettle! On Day 2, I showed up a mere 90 minutes late, but I was feeling much better. I had just donated $50,000 to charity ($25,000 to Doctors Without Borders and $25,000 to the Heifer Foundation). If I was going to go through this much money playing Chinese poker, then the least I could do was donate 10 percent of that total to charity! I think that this inspired me a bit; it certainly made me feel better about myself. I came in ready to play great poker, I came in ready to win the tournament. I mean, why not have the biggest win of my life? As I navigated through the day, two bad things happened to me. First, I picked up K-K, and ran into A-A. Then I picked up Q-Q, and ran into A-A (I still made it through the day). My opponent jumped out of his seat, and pulled his earphones off, and then I knew that he had pocket aces. Could this be really happening? K-K, K-K, and Q-Q in two days, all go down to aces? The flop was a good one, As-7s-3s; I now had the flush draw with my Ks. All I needed was a spade. After two blanks, I went crazy whining about my bad luck, kings, kings and queens, etc. The cameras rolled, and I showed my full anger and frustration for European television. I told myself that even though I used to love Monte Carlo, how could I ever come back? $536,000 to Ivey, and then I play way above the rim for two days and run into this nonsense? Call me superstitious, but I crossed the border into Italy (by car) by 11 p.m. that very night! Could I have folded my hand here? I could have been a hero and laid it down, but I’m not looking back thinking, “I should have folded.” I’m looking back and feeling like I didn’t have much choice. It’s so hard to fold K-K pre-flop that I didn’t even listen to my instincts. Too bad.